Imogen's Typewriter. : Books I Read in.. June! Books I Read in.. June! 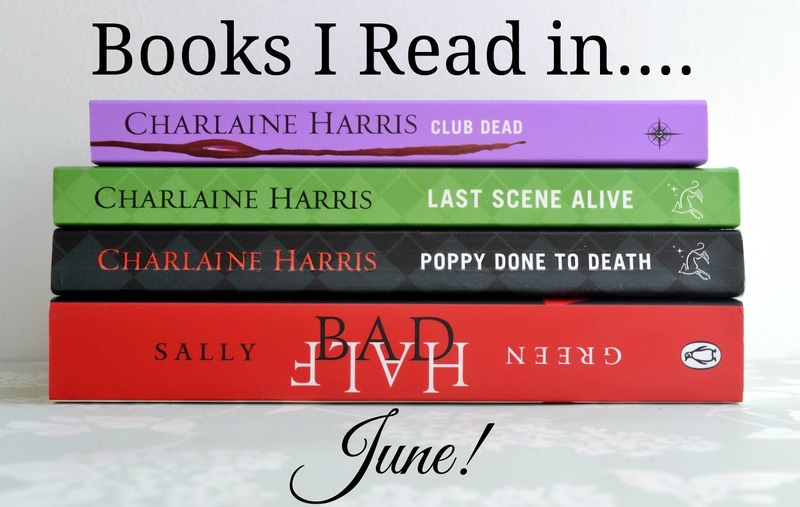 June was the month for reading Charlaine Harris apparently. I think she's becoming one of my favourite authors. I had a bit of a slump this month and found it pretty hard to pick up a book but I managed to read four and I really liked them all so- success! This is one of the books I want to read this Summer. One down, nine to go! I love the Sookie Stackhouse books but they get harder and harder to review as I get further into the series. I don't want to spoil anything! This was a great third book though and a certain character was revealed to be as nasty as I knew they were. Sookie is developing as a character and I love her personality. She's very realistic about how much she can handle and her self-value despite hearing what people think of her in their heads. Plus my favourite character from the TV show- Alcide- shows up and is even better in the book. I love him. I've already picked up the fourth book and I'm only 80 or so pages from finishing. This book was great! I was on shaky ground with this series after the fifth and sixth books but Last Scene Alive blew me out of the water. It may be my favourite one of the series. The plot was great, there were believable and clever sub-plots and the writing was on form. It's set around the murder of one of the cast, of the movie based on Aurora's life- and I love anything to do with acting and movies and TV and directing. It's one of my fantasy jobs to act so I really loved reading about it from Aurora's point of view. She's so down to earth and small town that she's just a lovely character to read the story from. "I learned a lot. The thing is, I didn't want to know most of what I learned." I'm a little confused as why a group of women would voluntarily describe themselves as Uppity but the Uppity Women Book Club is surely not without drama in the final book of the Aurora Teagarden Mysteries. It's not my favourite book but it pulled together all the loose ends while still being a satisfying book on it's own, hats off to Charlaine Harris for pulling off what most can't. I'm so sad this series is over! I can't quite believe it. I'm planning on doing a big series round up and review soon, especially with the TV special coming soon! Look on it as a challenge, I told myself briskly. Something rebellious within me muttered that it was sick of challenges. I really enjoyed this book. I got crazy Harry Potter vibes from it but this is Harry Potters moody older brother and it is in a contemporary United Kingdom but a much darker world for magic folk. The writing is what makes it stand out for me, it's simplistic and Sally Green uses more simple words rather than fewer complicated ones to put across what she means- and by default- Nathan, the main character. It's very clever as he isn't traditionally educated and has trouble with school, it was a risk but it paid off. I really need to pick up the second book; Half Wild asap! Something no to do with the writing though- my copy is falling apart. It's brand new, unbroken spine, and yet pages in the middle came out in a big chunk. Get it together Penguin glue! The great thing about hate is that it takes away everything else so nothing else matters. I also just hit 100 books read since I turned 20 which is crazy and I'm so happy. I'll be writing a post about this as soon and I stop stroking the books on my 'read' shelf and feeling tearful!